The Zetas have hinted broadly that the Council of Worlds may allow a severe wobble to occur, as is detailed in Issue 516 of this newsletter. Where it was addressed in 2010 and 2011, and has always been on the books, so to speak, for the Earth, it is time to revisit the subject. A severe wobble is not as bad as the sloshing that will occur during the hour of the Pole Shift, which will be tidal waves 500-600 feet high. A severe wobble is less than half that height, at 200-300 feet. In addition, the tidal waves are like a tide rolling in, not a giant wave crashing down, as depicted in the Dees illustration below. 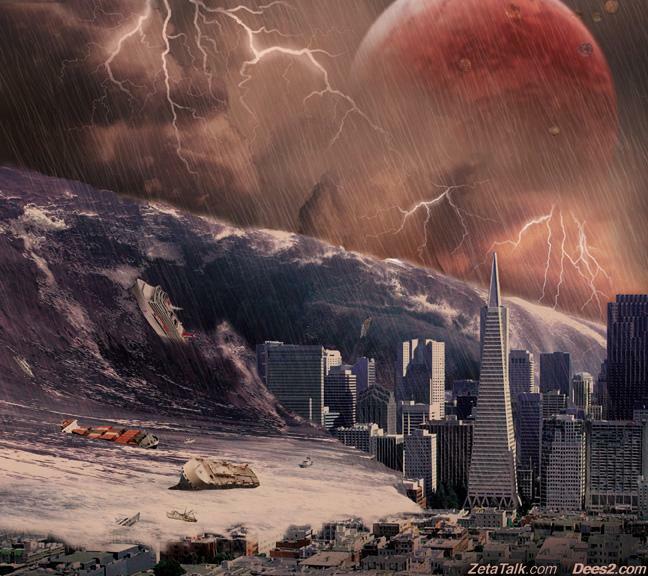 This is the nightmare most people entertain when they hear of Nibiru induced tidal waves. But a severe wobble will be bad enough. ZetaTalk Warning 8/25/2011: Planet X is approaching mainly from the right, in its retrograde orbit, though also somewhat Sunside on its way outbound from the Sun. The severe wobble will merely be an exaggeration of the existing wobble, where the magnetic N Pole is pushed as its current location in the Arctic near Siberia rolls over the horizon. As the globe is pushed violently northward, the waters in the Pacific will slosh southward, and waters in the Atlantic will slosh in the opposite direction, northward. 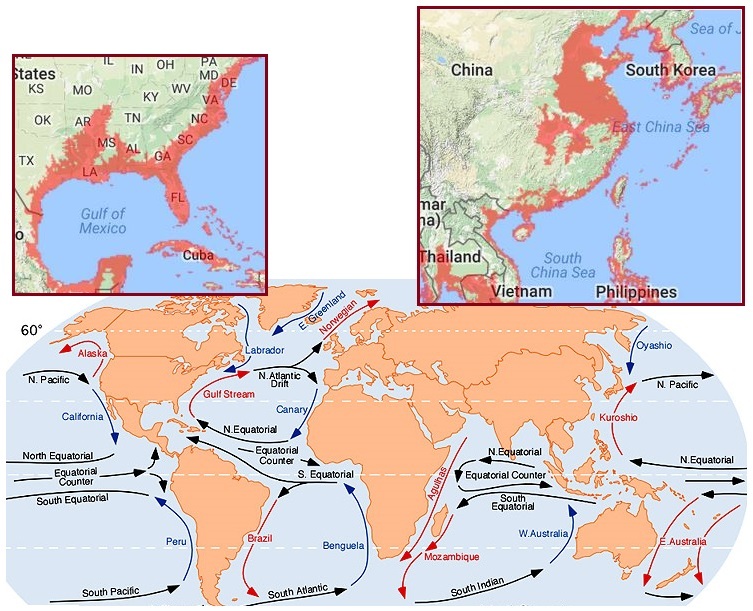 For the Pacific, the northern coastlines will be pushed under the ocean, and for the Atlantic, the southern coastlines will be pushed under the ocean. Then, 12 hours later, this reverses. The sloshing will be in a N/S direction, back and froth. The severe wobble slosh will be 200-300 feet high. Now that I have your attention, just what will a severe wobble potentially entail? Severe wobble sloshing is less than the Pole Shift sloshing, as during the Pole Shift the crustal shift stops, with the water on the move continuing up to a 500-600 foot tide. But during a severe wobble the globe reverses and returns, essentially moving back under the moving water, so the slosh is stopped. This high tide is more akin to the high tides experienced during a storm surge, where they roll in, as a tide, and prove to be above the normal tide for that particular stretch of coastline. However, where a storm surge is usually 20 feet above normal, severe wobble tides can be 200-300 feet above normal. ZetaTalk Pole Shift Slosh Description 2001: This is a flood tide, with the lip of the water being its highest point, rising like a silent tide endlessly on the rise, the wave rolling inland without a crashing back and forth, just a steady progressive inundation. To those at the mercy of such a flood tide, their first thought is to climb above the tide. Soon they are standing on the highest point they can reach, and still the water, flowing inland steadily, rises. Afloat on a boat or flotsam, they will be dragged inland with the flow until a reverse slosh begins, the water flowing back into its bed but in the nature of water during a slosh, overshooting this other side so that both sides of the ocean experience this flood tide, alternately, for some days until the momentum diminishes. When the flood tide recedes, those afloat are in danger of being dragged far out to sea with the flow, as the water will rush to its bed unevenly, more rapidly where it can recede the fastest. The Zetas equate the flood tide potential during a severe wobble to be more like the 2004 Ache tsunami, which rose to 100 feet in height and rolled in like a high tide. ZetaTalk Prediction 8/27/2016: We have explained in prior ZetaTalk that wobble sloshing is not as devastating as the Pole Shift sloshing. The primary reason for this is that wobble sloshing reverses, self corrects, where Pole Shift sloshing occurs when the crustal shift places the crust in a new position, and there it stays. We have stated that wobble sloshing during a severe wobble will result in high tides 200-300 feet high, and that the Pole Shift tides can be expected to be 500-600 feet high. In both cases, the higher tide is a result of tidal bore, the geology of the coastline, where water is funneled upward as it has nowhere else to go. There are other differences between a severe wobble and the Pole Shift itself. As Nibiru tightens its grip on the planets caught in the cup, Nibiru pulls to the right of the Earth steadily and the Earth and her sister planets (Venus and the Dark Twin) squeeze to the left. The Pole Shift is unleashed when Venus and the Dark Twin escape the cup, allowing Nibiru to draw closer to the Earth, but for a severe wobble these extreme positions are not in place. Nibiru is still not directly to the right of the Earth, nor is it close. Thus the severe wobble is a combination of a swing to the left into a lean to the left and back again, and a swing of the N Pole away into extreme darkness for the Northern Hemisphere and then back again. It will not reach the extremes that we have described for the Last Weeks. Nevertheless, it will be extreme enough that the entire population of the World will notice that something is amiss, the Sun very much out of place, and the establishment will not be able to sputter excuses fast enough. The people will know that the establishment is lying, and any such lies will doom the establishment to becoming a hollow voice no longer believed on any matter. If we have advised that during the hour of the Pole Shift, people be 100 miles inland and 200 feet above sea level to evade the Pole Shift sloshing. One could assume this to be approximately half that for a severe wobble, thus being 50 miles inland and 100 feet above sea level should suffice. However, local variances will exist, causing tidal bore, causing the tide to roll further inland before stopping, and caution would of course be better than not. We have described the severe wobble as likely to commence suddenly, without warning, so our advice for those likely to be affected is to sleep on the roof, or above ground, or be prepared to move if alarms are sounded. This will be a flood tide, not violent waves accompanied by high winds and flying debris. 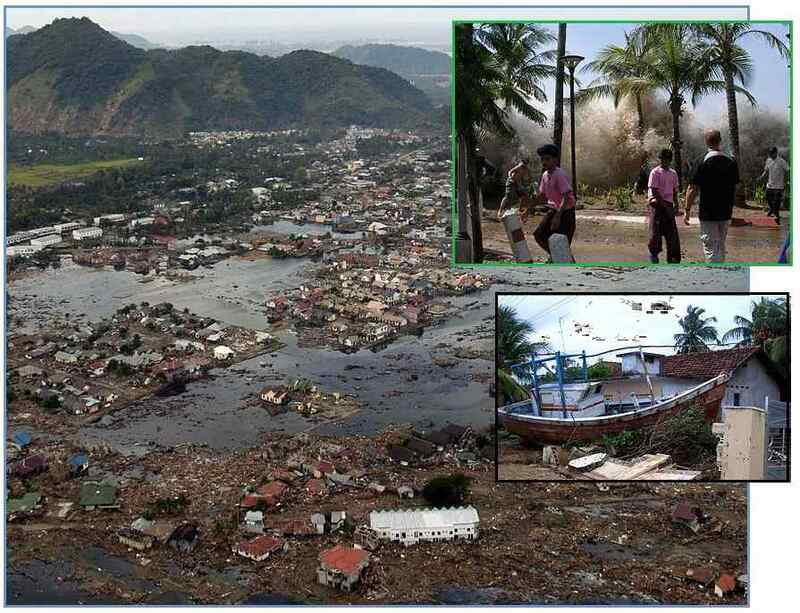 One could look to the tsunami in Ache in 2004 as an example of a flood tide rolling inland. The elephants knew, and took to the hills, but mankind does not listen well. It should be noted that we described the effect of a severe wobble back in 2011, and 5 years have passed since that time. A severe wobble was always in the cards, for mankind, for the Earth. We also described devastating tides as a result of 7 of 10 plate movements, particularly against Europe. Such devastation occurring prior to the hour of the Pole Shift should be viewed ultimately as saving lives, in that mankind will move away from the coastlines. Who is listening to the ZetaTalk warning about a possible severe wobble? We have in the past stated that Heads of State read ZetaTalk, and it is taken seriously. As evidence of this we have a sudden reaction in the German government, announcing that their citizens should be prepared to have a 10 day supply of food and water at hand. No particular threat was specified, though natural disasters were mentioned. 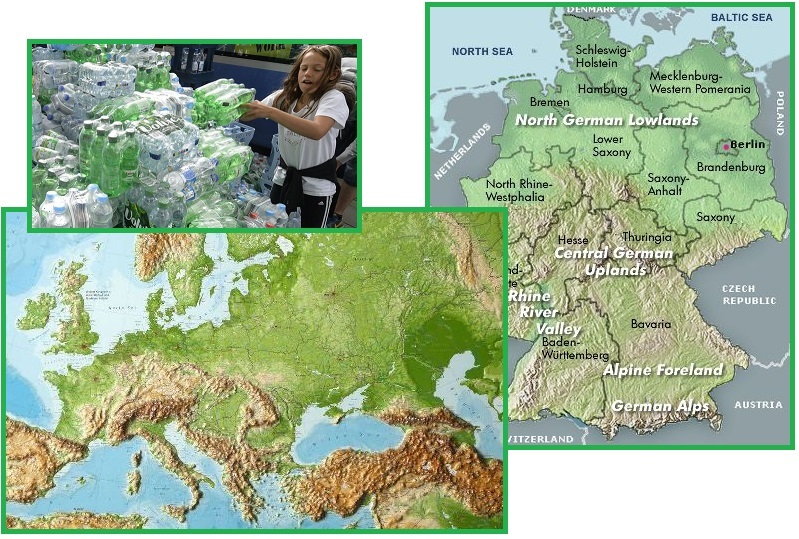 Germany, and much of Europe, is lowland and would become quickly flooded by a severe wobble flood tide. Germany is planning to urge its citizens to stockpile food, water and other supplies in the event of a catastrophe or armed attack. German authorities are set to introduce a new state defense plan that would make citizens stockpile food and water, enough to last for at least ten days, in the event of a major disaster or an armed attack. The nation is to be encouraged to put away food reserves to take care of themselves in case of emergency. ZetaTalk Prediction 8/27/2016: What is Germany anticipating, that they are about to instruct their citizens to have enough food and water to sustain themselves for 10 days. Natural disaster or an attack was mentioned, but neither seems eminent. A terrorist attack would be local, and not require food and water for the entire country. What attack would occur? Unless NATO attacks Russia, there is no conceivable conflict. Do Merkel and the German government fear that ISIS has so thoroughly infiltrated Germany that the country could erupt into civil war between ISIS and the German people? Since Merkel is still extending a welcoming hand to immigrants from Syria, this does not seem to fix. Thus, the only cause left is a natural disaster. Germany is lowland, at least the northern part of the country, and would be awash if a major sloshing of the Atlantic were to occur. Of course this would also be true of the Netherlands, Denmark, the eastern coast of France, and parts of the UK, but they are not Germany’s concern. We have been hinting broadly that to provide cover for Dunford to delay and defer the 2016 elections, the Council of Worlds might give Dunford cover, and the most likely event would be a severe wobble. Such an event as described in detail by ourselves would potentially cause flooding in Germany. It is obvious that Merkel and the German government take ZetaTalk seriously. This was then followed by a similar warning by the Czech Republic, Germany’s neighbor. Why would an ISIS terror attack, a local affair, require citizens to be “self-sufficient”? In that the lands to the North of the Czech Republic would be flooded to a great extent, they would likely have a refugee crisis from the North. If all of Berlin were to head directly to the highlands, they would arrive in the Czech Republic. Then rumors from Finland hit the news, with citizens quietly being told to stockpile food and water. Finland has a long coastline, surrounded on three sides by the Gulf of Finland and the Gulf of Bothnia. Then news emerged that western and central Russia were calling up their Reserves. This was all postured in the context of war, but other European states were strangely passive if this was the case. It fits a pending slosh, a tidal bore up toward Finland, not war. Czech media is reporting that the country’s food reserves are “struggling” and would be incapable of meeting demand in the event of a national crisis. Supplies of milk powder are particularly low. The government is calling on citizens to increase their “self-sufficiency” and “food safety” by stockpiling more food. Now Finland Too! Local Councils Warning Citizens "Stockpile Food & Water - Prepare"
First it was Germany, last Saturday (20 Aug) which began warning its citizens to "stockpile 10 days worth of food & water." One day later, the Czech Republic warned its citizens "prepare for the worst." Now Finland is warning its citizens too "stockpile large quantities of food and water, something bad is coming." The warnings are being issued word-of-mouth throughout Finland, and being done very quietly but quickly. These warnings are coming from official government entities in Europe and they come at a time when tensions are rising everywhere. Reservists in the Southern, Central and Western Military Districts are being called up, and trucks from the civilian sector are being transferred into military service as per the mobilization plans. In addition, workers in militarily vital industries in southern Russia are being conscripted into the Ministry of Defense - they can no longer quit or transfer without military approval for the duration of the alert. This call-up of Reserves is almost unprecedented. They've never called up the reserves. Not for Crimea, or Georgia, or even even Chechnya. And where is that water to go, sloshing in from the Atlantic, when it arrives at Finland? It would bore inland, as it has nowhere else to go. Tidal bore is water on the move as the pressure behind it is unrelenting, as the Zetas explained at the start of the ZetaTalk saga. During the Pole Shift tides, or tides accompanying a severe wobble, tidal bore should be expected. 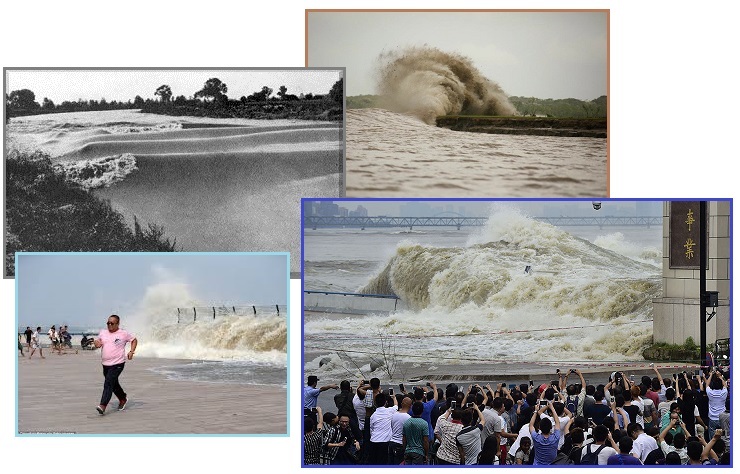 ZetaTalk Explanation 6/1/1999: Those who have witnessed tidal bore roaring up a ravine are astonished that water does not seem to respect the relative sea level during those times. What makes the water climb? Water pressure drives water to climb above its level because at the point where the pressure build, it takes the easiest path. When the force of pressure is extreme, compressing the water at lower levels, the path of least resistance is taken. During a tidal wave, this path is away from the bulk of water. A tidal wave moves inland until one of two situations occurs: the level to which it has climbed is higher than the level elsewhere, and the wave recedes, or the pressure behind the wave decreases. Where tidal waves meet mountains, this can result in tidal bore up ravines. 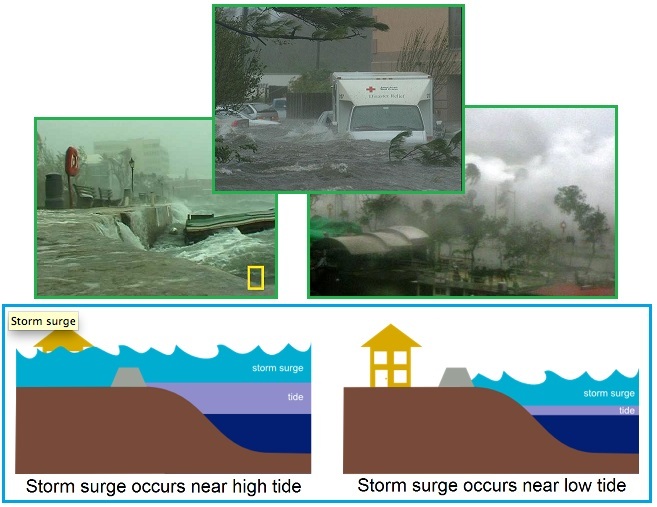 Where tidal waves flow inland, this results in a flood tide going hundreds of miles inland. Where the tidal wave finds foot hills or barriers, the force of the wave is broken such that it is slowed, allowing a reduction in pressure behind the wave to arrive before the wave moves far inland. But where the tidal wave finds virtually no barriers, due to the land being flat, it becomes water on the move, and this very momentum carries it far inland, and above a height that would otherwise be expected. Why would Europe be more affected during a severe wobble than the rest of the world? 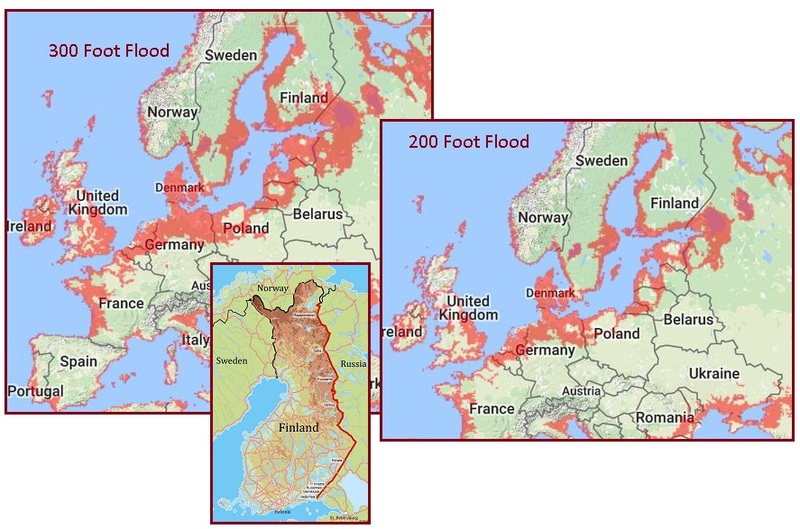 Europe is at the receiving end of Atlantic tides, which will tend to get caught after they flow through the English Channel and into the Bay of Finland. Sloshing water will move along with existing tides. Elsewhere around the globe, a severe wobble tide will not get trapped, though the East Coast of the US is vulnerable, as is China, due to extensive lowlands. We recently covered the newly discovered planetoid Niku’s retrograde orbit, detailing how this was a Prong 3 bonanza in that it opened the door for other objects in the Solar System with a retrograde orbit to be discovered. We are speaking here of Nibiru, which has a retrograde orbit, a retrograde rotation, and a tail that swirls in a retrograde motion. Now there is another announcement, about Proxima B, an Earth sized planet orbiting Proxima Centauri in the habitable zone. What might this mean, and is it related to the Prong 3 agenda? 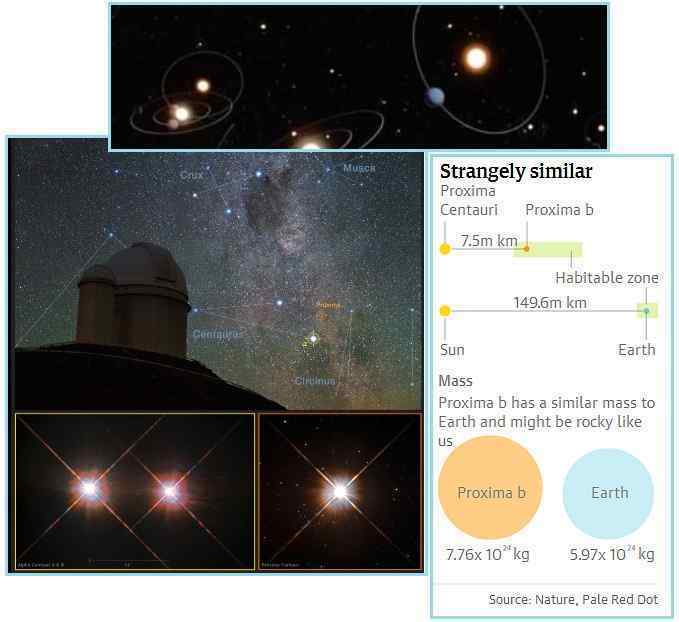 Proxima B was discovered by the ESO’s observatory in Chile, by the very same crew that runs the Dark Energy Survey by which Nibiru will be found in the infrared star charts. This is all more than a coincidence, per the Zetas. In a discovery that has been years in the making, researchers have confirmed the existence of a rocky planet named Proxima b orbiting Proxima Centauri, the closest star to our sun, according to a new study. It is the closest exoplanet to us in the universe. Given the fact that Proxima b is within the habitable zone of its star, meaning liquid water could exist on the surface, it may also be the closest possible home for life outside of our solar system. The search for life outside our solar system has been brought to our cosmic doorstep with the discovery of an apparently rocky planet orbiting the nearest star to our sun. Named Proxima b, the new planet has sparked a flurry of excitement among astrophysicists, with the tantalising possibility that it might be similar in crucial respects to Earth. ZetaTalk Insight 8/27/2016: Why the sudden flurry about Proxima B when it had been known to exist for over a decade? This is indeed a Prong 3 assist, with the main character in the announcement the ESO’s observatory in Chile. This will likewise be the source of the announcement when Nibiru is discovered, as the Dark Energy Survey is run from this Chile observatory, the very same crew scanning the infrared images from past years looking for exoplanets. Prong 3 cover is also being provided by the emphasis on confusion, that Proxima B was elusive. The trend has been to discover exoplanets galore, so as to pave the way for the discovery of Nibiru in the Dark Energy Survey star charts, in a retrograde orbit, arriving right where it rides today, next to the Sun. The trend has been to emphasize potentially life bearing planets being discovered, so as to pave the way to a tacit admission that the alien presence is real, and has been on Earth for millennia. The public is to arrive at this conclusion, as no formal announcement about the alien presence will be forthcoming from the establishment. We will avoid the sticky cover-up by just leaping to the conclusion. Why is it necessary to emphasize that life elsewhere can exist, that intelligent life has likely evolved elsewhere, and since there are worlds equivalent to Earth that this life might find Earth compatible? Is the establishment intending to announce that the Annunaki exist and are inhabiting Nibiru? This fact can hardly be avoided, given the vast Earth history on the Annunaki. The Great Pyramids, massive stones such as the Easter Island heads moved about with ease, and legends of demigods larger than man walking the Earth. The admission that Nibiru is real and at hand leads to ZetaTalk, a communication by aliens, and this then leads to the Annunaki legends. It is inevitable. Pole Shift denial occurs when mankind looks with tunnel vision, refusing to take in all the facts at once, because the thought of riding on the Earth plates, sliding over the slippery magma to a new location, is just too terrifying. Thus they look at the Ice Ages and do not see that the N Pole was located in different places, moving every 3,600 years. Archeologists are puzzled that humans could be on the N American continent more than 13,000 years ago, when the Bering Strait was assumed to be too cold to traverse prior to that. Per the Zetas in 16,000 BC the N Pole moved from Wisconsin to Finland , and in 12,400 BC moved again to the Barents Sea north of Sweden , and in 8,800 BC moved again to the East Siberian Sea , and then in 1,600 BC moved to Greenland  . Thus the Bering Straits were not frozen solid during the years in question. 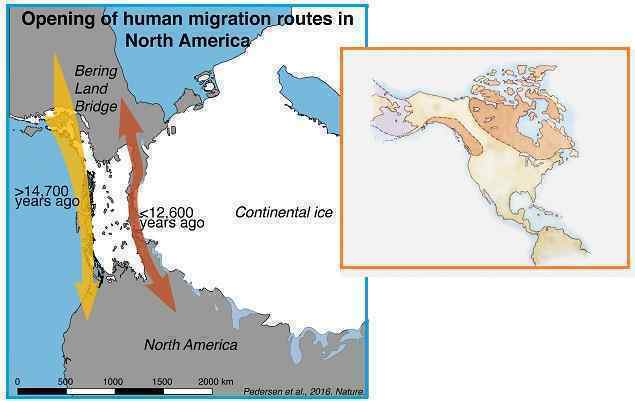 Scholars have long theorized that the first humans to populate the North American continent likely traversed a long-vanished land bridge that once linked Siberia and Alaska over the Bering Strait. A new study published today in the journal Nature, however, challenges the conventional view by finding that the entry route was not “biologically viable” until hundreds of years after the first Ice-Age humans arrived on the continent. Archaeological studies have found that human colonization of North America by the so-called Clovis culture dates back more than 13,000 years ago, and recent archaeological evidence suggests that people could have been on the continent 14,700 years ago—and possibly even several millennia before that. ZetaTalk Explanation 8/20/2016: This whole controversy is a non-issue, due entirely to Pole Shift denial. Of course the Bering Straits were not frozen over all the time. Nor were they flooded to the degree they are today either. 18,000 years ago the N Pole moved from N America to Scandinavia and 14,400 years ago moved from Scandinavia to the Barents Sea. Thus the Bering Straits were hardly frozen solid 14,700 years ago when the presumed migration from Asia would have occurred. This type of fractured thinking is typical of many humans, who cannot deal with all the facts so discard what does not fit. The Earth did not have Ice Ages, it had crustal shifts. Nothing else fits.